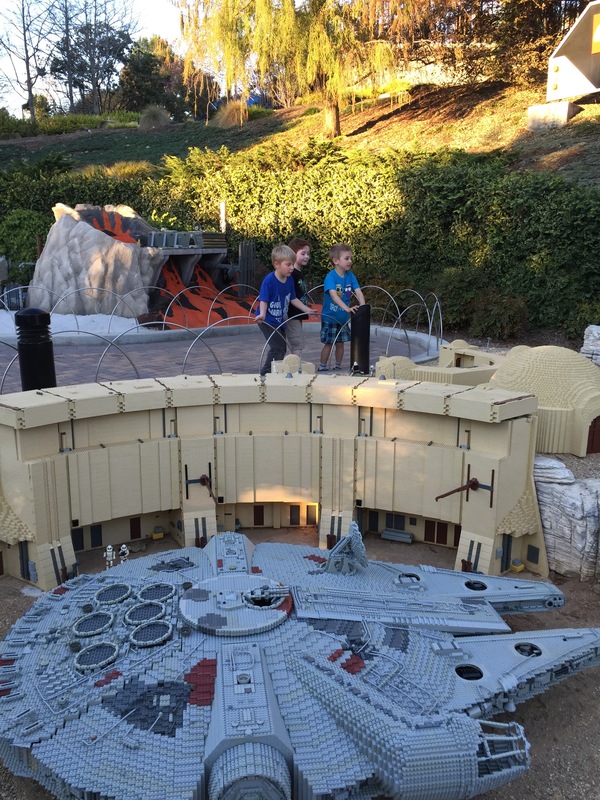 Disclaimer: I received tickets for Legoland to complete this review. No other compensation was given. All opinions are my own. When Wonder Boy was a wee tot, we kicked it with a group of moms that had been pulled from here and there, all with babies born within a six-week span of each other. Of course, as life does, we have split up a lot since then, including two moving away and the first year of kindergarten taking away our playdate time. Last weekend one of the little boys and his family came back for a quick family visit, so we gathered up a couple of the old crew and headed to Legoland, which was close to where she was staying. It was the perfect choice for three five-year-old boys to reconnect after over three years apart. With four adults to a six kids (three younger siblings and my mom came along) it was a busy day of fun. 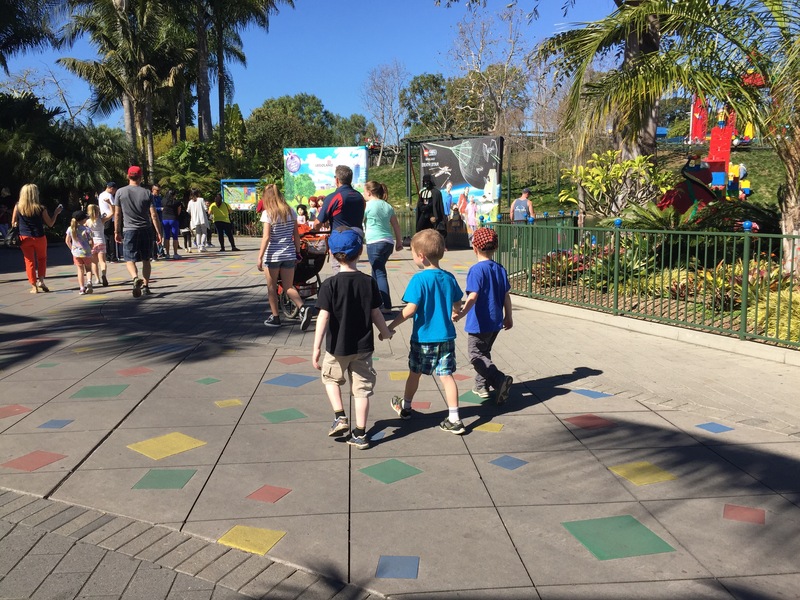 The pros of a theme park geared toward smaller children are that they can ride most of the rides or find fun things to do in the park’s play areas. 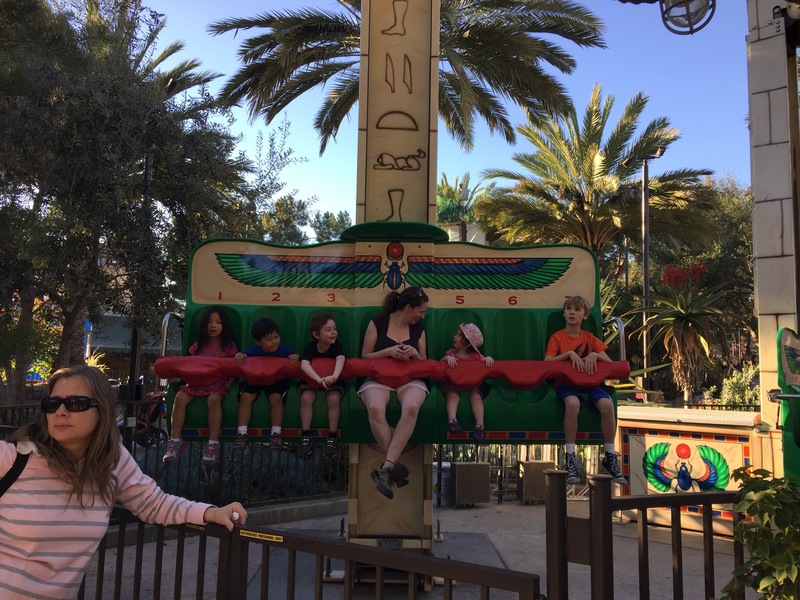 However, most of the rides required a height of at least three feet tall, which put all three of the younger siblings on ride time out. Often, we had to split up duties to accommodate. The boys stood in line with an adult for a ride, the littles got to play on the cars parked perfect for photo ops. 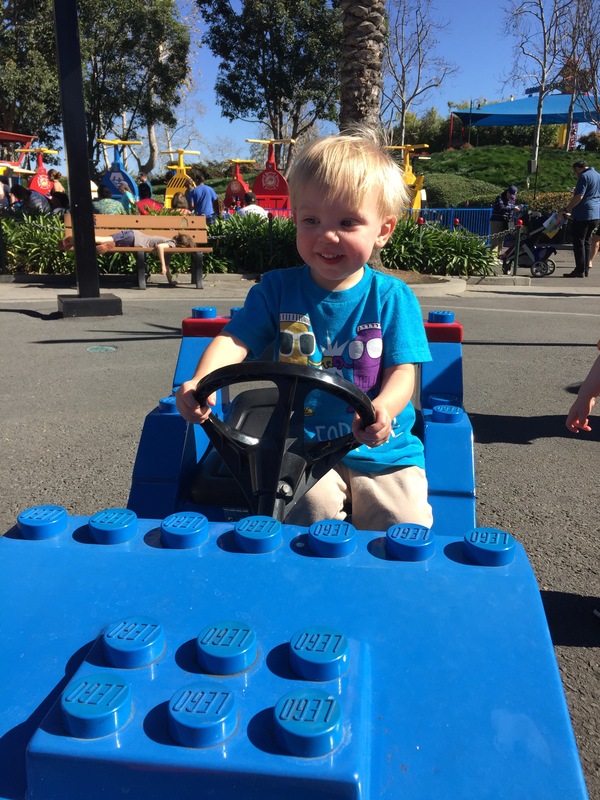 We ended up ride-swapping and took turns watching the babies play in an area full of different-sized building blocks while she waited in line for their turn. It made the day go by slower, but luckily there was usually something fun to look at. We only had one sad baby missing his momma for a bit. 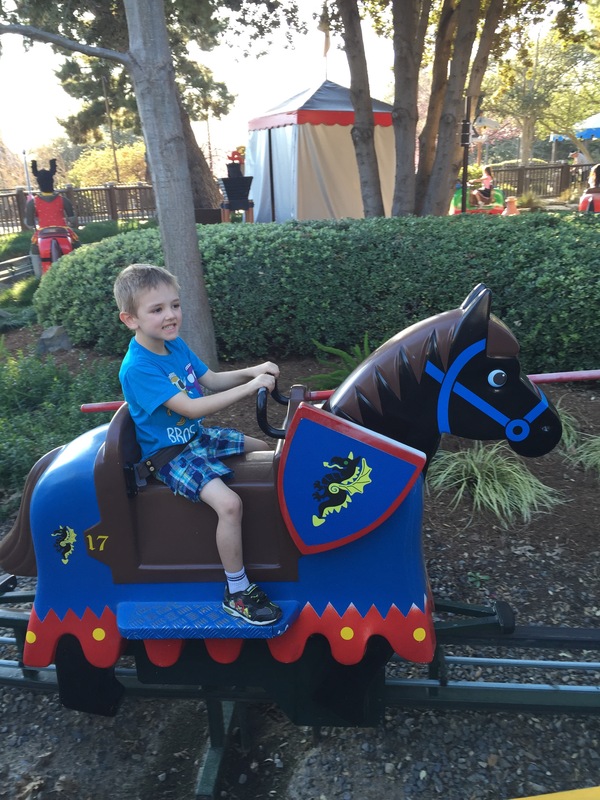 We tried to aim for things the kids could do on their own, like the Royal Joust. The big brothers rode their mighty steeds after we all got ice cream, while the siblings watched and started to get sugar-crazy. There were a times where it worked out well, and we all got a chance to ride with everyone while grandma got to sit for a moment and relax (holding a sleeping Lil’ Wonder). If you’re going with multiple ages, be sure to take a look at the height and age requirements online and plan your trip accordingly. It seemed a lot of rides required a 36″ height. 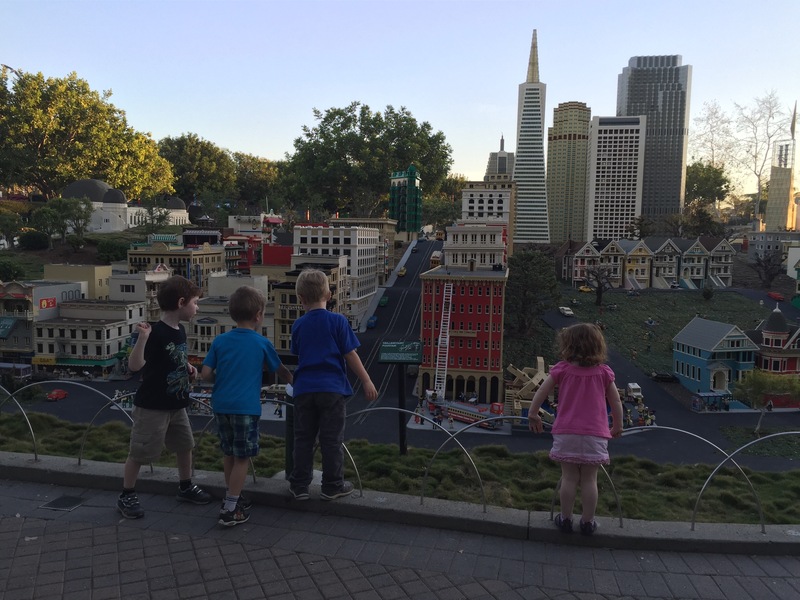 We were slow enough going around the park we missed out on a couple places the boys would have enjoyed, but we meandered through the Lego buildings in the center of the park on our way to the front. The Star Wars were a hit. I want to come back and check out the Death Star they’re building! Opens in March. If you haven’t been to Legoland the size of the models are impressive, and there’s a lot to look at, little details and buttons to push and boats to drive. It’s a complicated place to walk, so keep a hand on a map and don’t be afraid to ask for directions. Have an open mind, since there are many little things hat can distract a kid, like Lego blocks at waiting areas. Sunscreen and a hat – there’s a lot of open areas! If you’re going to go on rides try to keep peoper ratios for adult/child seating. Some rides allow older kids to ride alone, look at the website for some details to help plan your day. There is a giant Lego store at the end. If you have one locally, a lot of the stuff is the same. There are some unique merchandise, like “I Love Legoland” people on magnets and such. Build your own minifigs (the little Lego people) three for $9.99. perfect for inspiring their own creativeness at home! 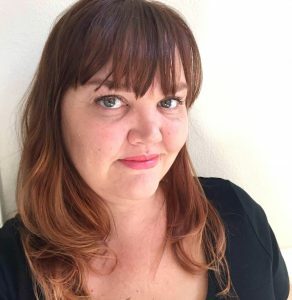 The measles outbreak – a map project in progress	Tracking measles – is it important to do it publicly? Hey there. I found your blog employing windows live messenger. It really is a seriously neatly composed article. Let me ensure that you take note of this and come back to read more of this practical information.. blue voyage turkey Wanted submit. I will unquestionably returning.